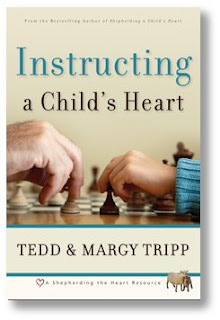 I had forgot about going through the book "Instructing a Child's Heart" and no one said anything about it until last week. I received a comment/email that someone asked why I had stopped at chapter 9? Rather than give a reason, here is chapter 10 and I will continue the series. This is an incredibly important chapter of instruction for you as a parent. It starts out with this statement, "When our children are confronted with temptation to sin, difficult circumstances, or the sting of the sin of others, we want to show them the beauty of resting in Christ - being complete in Him." We often try to give our children tools to deal with these issues that are far inadequate for what they need and all they need is Christ. The Tripps provide a step by step means to show how we can be complete in Christ. They use a series of diagrams that provide an overview of the storyline of Scripture - creation, fall, redemption and the implications of them. This is a chapter where the gospel is clearly presented and how it is connected to the narrative of Scripture. 2. If your child is young, master the material in order to bring to your child the information at a level they will understand. Charles Spurgeon said that if a child is young enough to understand sin, they are young enough to understand the gospel. 3. As you have brought counsel to your child for the situations they have faced, how have you brought the provision from God in Christ? How can you grow in this area as a parent?